Remember the time 20 years ago? No Internet, no emails and no Justin Bieber. Two of those things are actually challenging to imagine living without if you are an engineer nowadays. Two decades ago you would have had to call your local sales guy, asking her or him to bring a truck load of brochures, books and data sheets a long. Searching for the right, innovative product you could have spent hours scrolling through these papers (while listening to good music…). Back in the day some creative EBV guys came up with a wonderful idea: make one brochure with the most innovative products of the time. The new booklet which was born was called “Marketing Innovative Products” or in short: the MIP. We spoke to Erich Brockard, EBV Director Application Central Europe, one of the “fathers” of the MIP. Erich Brockard, you have been involved in the MIP over twenty years ago when the first one was issued – can you tell us more about the original idea and why you came up with it? How to find the best Products available? So the idea for the MIP is easy to understand – but who and how are products selected? Is it possible to shrink the flood of semiconductors down, fitting it in a small book? Antonio Fernandez, EBV Director Technical Marketing, should know. Antonio Fernandez, can you tell us how the content of the MIP is defined and what the process behind it looks like? The content of the MIP is currently a selection of New Product Introductions specially made for our customers all over Europe. The products must be innovative, solving specific design needs, must be available and well supported. Our manufacturing partners make a proposal that is voted by our sales team, application engineers and market and technologies specialists always having our customers in mind. So the products are voted by a team of people working closely with our customers. 20 years after the first issue of the MIP kids are streaming Justin Bieber via Spotify and we can search – sorry “google” – semiconductors via the internet. So no need for us to order tons of paper information anymore. Why is the MIP still that successful? Maybe Karim Khebere, EBV Vice President Technical Development, knows more. Karim Khebere, the MIP is very successful for more than 20 years now – what are the benefits for the customer nowadays? My believe is that despite the digital experience/trend, customers are still willing to face people, thus getting attention and physical support about new trends, technologies, ideas and so on. The MIP’s intentions in the beginning, as summarized by Erich before, was perceived as a great vector of information to our customers, thus down new/innovative parts. Despite the fact that we can get those information online, it remains absolutely true that the dialog with a customer still needs a framework (or a vector), and this is where the MIP still plays a nice role. Think as well of the new comers we have in our company (sales or FAEs): when they visit their customer for the first time for EBV, the best dialog tool is the MIP, because it helps them to cover our line card, thus across innovative devices and solutions. This enables then our customers to get a comprehensive update on what our different suppliers are providing by product group and applications. Other nice indicators like the price information, the QR code to get the spec online immediately etc… allows as well our customers to be enabled quickly whenever they have an article’ interest. And last but not least, when they have a time off (lunch, travel,…), what can they bring with them to read (aside of using the Smartphone)? The MIP! So after 20 years the MIP’s functionality changed from a brochure helping to get more information quickly to a tool helping to get an overview about the most innovative technology without getting overwhelmed by the flood of information the internet holds. Here is to another 20 years of MIP! Innovation is part of the MIP’s content… and also of its layout! Therefore the MIP is available for free for your tablet, just select your OS below to get redirected to the “EBV Products” App. I am now following the MIP since 2000, what a change in every way! I remember the black& white editions and the change to color printing. And now the change to a superb tool for engineers. 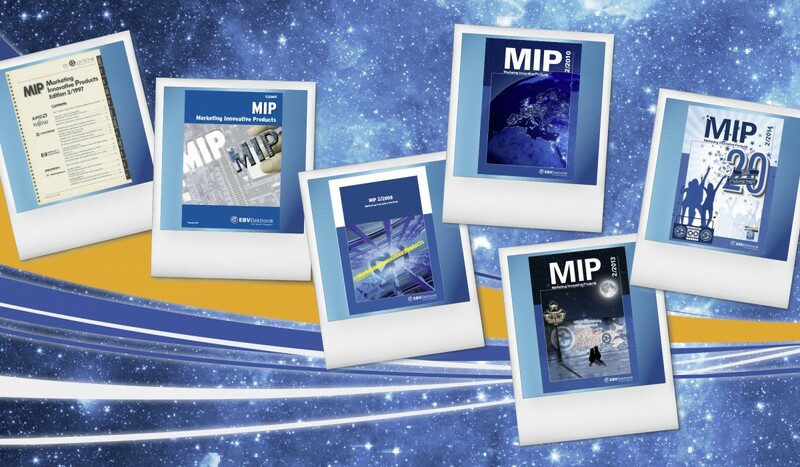 If you have a look at the technologies inside MIP now and in the former editions, you nearly can not believe what happened in these few years. Congrats, MIP!